3.5” HVGA TFT-LCD screen display/480(RGB)*320 resolution/AHD coaxial test/PTZ control/Color bar generator/ 12V 1A power output. The new AHD coaxial tester is developed for the On-Site installation and maintenance of coaxial camera, it also combine other functions analog camera test, analog signal output, port finder, UTP test, digital multimeter, optical power meter and TDR cable tester etc. Its portability, user-friendly design and many other functions make the tester an essential tool for all installers or technicians. 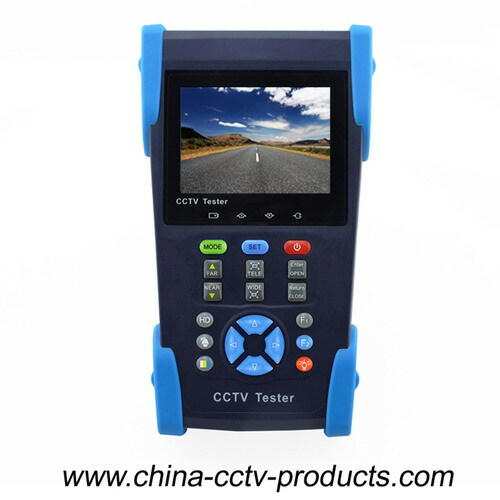 3.5”HVGA TFT-LCD screen display/480 (RGB)*320 resolution /HD coaxial test (AHD) /PTZ control/ Color bar generator /12V 1A power output.it also combine other functions analog camera(CVBS) test, UTP test.